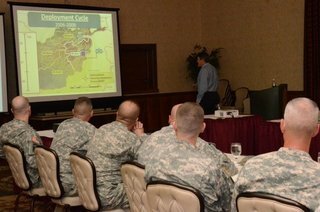 Gary Linhart, an instructor with the Combat Studies Institute, explains the situation that led to the Battle of Wanat during a virtual staff ride for battalion and brigade leaders Friday at the Officers' Club. FORT JACKSON, S.C. -- Commanders and command sergeants major of the Army Training Center battalions and brigades came together Friday for a virtual staff ride to analyze and discuss the Battle of Wanat. During the battle, which was fought in 2008 by members of the 173rd Airborne Brigade Combat Team in a remote area of Afghanistan, nine Americans were killed and 27 were wounded. "This is important. ... I think it's awesome that we get the opportunity to study this particular battle," said Fort Jackson Command Sgt. Maj. Brian Stall. "We have a range that we renamed Wanat; and one of the Soldiers who fought this particular battle was presented with his Silver Star on this site." CSI technician Dale Cordes was able to reconstruct a 3-D computer model of the terrain, which was projected on one of the two screens throughout the presentation. The technology allows Cordes to zoom in on any area and change the point of view to simulate the view the Soldiers had at that particular location. "The initial model took about 10 months (to build)," Cordes said. "Then we added more details to it as we'd gotten more witnesses -- guys who were fighting there. We talked to them to make sure we got everything right and all the positions in the right place." CSI instructor Gary Linhart said the Battle of Wanat was a logical choice for development into a virtual staff ride. "It was, at that point, (the battle with) the highest amount of casualties in the war. ... There was an investigation done, so there was information to get at. We have the terrain available. So, we literally looked at it and said, 'This is probably a good case study,'" Linhart said. "We started building from that. We were going to create this staff ride for this particular battle because it had good lessons to be learned and it was a high-casualty-producing event." The virtual staff ride was part of the installation's Leadership Development Program. Mike Ryan, Fort Jackson's strategic planner, said the program consists of three main components: Bi-monthly luncheons to discuss the Profession of Arms concept; yearly training with the Center for Creative Leadership; and two staff rides per year. He said the staff rides have a two-fold purpose. "We try to emphasize the importance of history and the lessons learned," Ryan said. "You can look at it from a strategic and a tactical level." Whereas most of the staff rides include trips to historic battlefields of the Revolutionary War and the Civil War, the virtual staff ride allows leaders to analyze more recent battles fought in areas that are not accessible. Ryan said the analysis of contemporary battles like Wanat creates a connection because of its relevancy for today's troops. "This is a fascinating battle (in terms of) what went wrong and what went right," he said. "There are many specific individual tasks that correlate to what we do here in Basic Combat Training and Advanced Individual Training." Stall said he was impressed with the technology and its abilities. Col. Drew Meyerowich, commander of the 193rd Infantry Brigade, shared a similar sentiment. "The virtual staff ride provided leaders the ability to understand the terrain without actually walking the ground and allowed us to get back to the basics of defensive planning, preparation and execution," Meyerowich said. Stall said that the spirit shown by the Soldiers at Wanat can serve as a model for his Soldiers. "I hope that what (the sergeants major) get out of it is go back and talk with their cadre about the importance of the warrior spirit. ..."